Authorities of Obafemi Awolowo University, Ile-Ife, say a 400-level engineering student, Miss Oyinlola Rotimi, did not attempt to flush her newborn baby boy down the toilet at Moremi Hall on Wednesday. Rotimi had caused commotion when she was seen in the toilet with the baby. But a statement by the Head, Public Relations Unit, OAU, Mr Abiodun Olanrewaju, on Thursday, said Rotimi did not attempt to kill her baby, whom he said was rescued from the water closet of the toilet. He said an investigation into the incident showed that Rotimi had no intention to kill her baby, adding that she was inexperienced about labour. The statement read, “The truth of the matter is that, there was a delivery of a baby boy by an inexperienced mother who, in her naivety, thought she was pressed by call of nature while she was actually in labour pains. “Prior to the appearance of the baby, the young, inexperienced mother had discovered that she was bleeding and went to the toilet only to observe that something expelled into the water closet. “It was at that juncture that she screamed and shouted for help when her friend, Miss Satope Oladayo, heard her voice and traced her to the toilet from their room. It was when Satope entered the toilet and found the baby that she (Satope) called an elderly cleaner for assistance because the two of them were novices in childbearing. 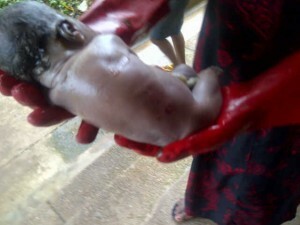 “As of now, Rotimi’s mother is with her and she has started breastfeeding her baby.